This is Lili's OLD WEBSITE! Go to liliwilkinson.com.au for the shiny, better, more up-to-date, awesome version. LOOK AT MAH FANCY NEW WEBSITE. It's now liliwilkinson.com.au, not liliwilkinson.com. This is Important. Also my blog is now here, and the RSS feed is here, but if you already subscribe via RSS it should update automatically. Tolkien was a Catholic, for whom the basic issues of life were not in question, because the Church had all the answers. So nowhere in 'The Lord of the Rings' is there a moment's doubt about those big questions. No-one is in any doubt about what's good or bad; everyone knows where the good is, and what to do about the bad. Enormous as it is, TLOTR is consequently trivial. Narnia, on the other hand, is the work of a Protestant - and an Ulster Protestant at that, for whom the individual interaction with the Bible and with God was a matter of daily struggle and endless moral questioning. That's the Protestant tradition. So in Narnia the big questions are urgent and compelling and vital: is there a God? Who is it? How can I recognise him? What must I do to be good? I profoundly disagree with the answers that Lewis offers - in fact, as I say, I detest them - but Narnia is a work of serious religious engagement in a way that TLOTR could never be. From an oldish interview here. Are you wondering what to do with your life? Are you looking for a niche that needs to be filled? Somewhere where you will be needed, appreciated? Somebody, please, open a butcher on Queens Parade. There are two empty shops available, or you could take over one of the 8 cafes, 4 hairdressers, 4 bakeries, 2 chicken & chips shops/pizza places/florists/fruit&veg. 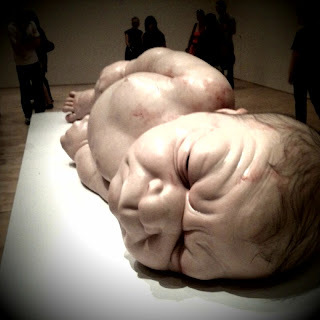 I went to the Ron Mueck exhibition at NGV yesterday. It was extraordinary. Ron Mueck is an Australian-born artist, who creates hyperrealistic sculptures at adjusted and unusual scales. He had a good education in the surreal and uncanny, working for Jim Henson as a sculptor and puppeteer (he played Ludo in Labyrinth - squee!). The first piece - Dead Dad - was a very vulnerable naked replica of Mueck's father after his death. The sculpture is scaled down about 2/3, and is the only one of his sculptures where Mueck used his own hair. There's almost no explanation about Mueck's work in the exhibition - we are invited to come to our own conclusions. One of the most fascinating things was seeing what caught people's attention: blood on the giant baby's toenails, the Wild Man's feet, the bunched brown stockings on the two old women. People saw their grandparents in some of the pieces, Christ in others, and themselves in many. It was the perfect kind of utterly democratic art - you don't need to be a critic to "get" it, and it means something different to everyone. There were plenty of children in the exhibition, and they too were fascinated - I suppose the constant reevaluating of your scale in relation to others is something that children are very familiar with. Looking for a girl who can make her own clogs? I am curled up on the couch with endless cups of tea today, learning how to guddle (or tickle) trout, skin a rabbit, make cider, sweep a chimney, lay out a hedge maze, make a weathercock, right a wheel, craft a Welsh love spoon and paint a canal boat. Is it wrong that now I'm actually kind of looking forward to the apocalypse? So I can wow everyone with my ability to work scrimshaw and make my own besom broom? My agent recently shared some of her teen writing, and as it's my birthday and you're not allowed to be too mean to me, I'm going to be brave and do the same. “Thank you,” said Nellwyn, and they turned away. The next evening, Nellwyn came down reporting bad news, he had not seen the explosions because of the high mountain peaks, but he had seen a gigantic flock of evil-looking crows flying in their direction. “These aren't just a few crows,” Nellwyn said, frowning at the thought Flontale might be braver than one of the best fighters in the village. “They're huge! Each one has a wingspan of about three feet, and their eyes - ugh.” He shuddered. “How many?” asked Dadoe, reaching for his axe and testing the point with his thumb. Dadoe was never one to mince words. The Third of the Yswin reached into the three's minds. He sighed, and called for Elondwar. He hadn't really wanted to become a God. Of course it was nice having the power to make the kingliest of kings bow down to Him, but a lot of hardships came with being a God. He looked up, “Entertain me, Elondwar.” He said wearily. She grinned mirthlessly, showing her long, blood-red fangs. He leapt, catlike over a fence, and slid in the window of a peasants house. Inside, four peasants were asleep. Tel crept over to one of them, and raised their wrist to his lips. Ari saw him bite down hard, and the peasant jolted in pain, but slept on. As Tel drank, the colour came back into his face, and he straightened, sliding a gold coin into the still-sleeping peasant's clenched fist. 1. Angel Fish is a CBCA Notable book for 2010! I'm so very happy about this. Pink and Angel Fish came out at the same time and everyone was very excited about Pink, and Angel Fish was like the quiet child who people often don't notice. So it's nice to be noticed. I'm also just really pleased with the Older Readers shortlist this year (despite not being on it) - it's a great mix of books, with some fresh new faces as well as some old favourites. And LOTS OF GIRL PROTAGONISTS! 2. There's a new SHORT anthology out! I didn't edit this one, but I DO have a story in it. The anthology is Short and Scary, and my story is called The Moth-er. 3. Angel Fish is going to be published soon in the UK, except it's going to be called Company of Angels. The UK cover is awesome, and I hope to be able to share it (and the US cover for PINK which I've just seen) very soon.